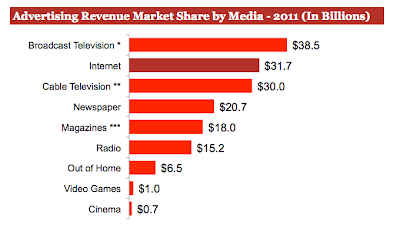 Like 2010 Internet once again beat Cable TV in attracting more ad dollars in 2011. While mobile only accounted for 5 percent of the Internet ad revenue in 2011 it was the fastest growing ad category up 149 percent to $1.6 billion in full-year 2011 from $0.6 billion in 2010. Digital video, a component of display-related advertising, saw a significant uptick of 29 percent year-over-year, bringing in $1.8 billion in revenue in 2011 compared to $1.4 billion in 2010. 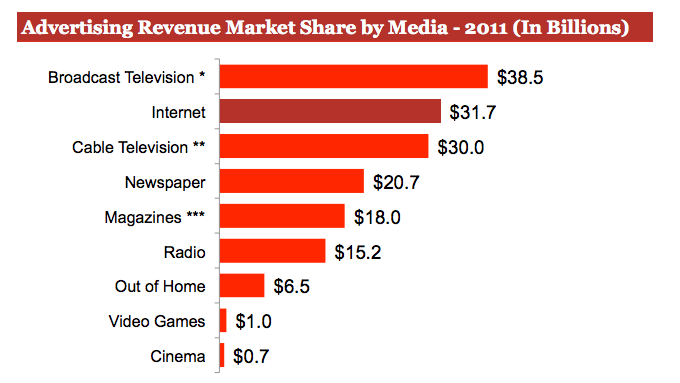 Display-related advertising revenues in 2011 totaled $11.1 billion or 35 percent of 2011 revenues, up 15 percent from $9.6 billion in 2010. Search revenues in 2011 totaled $14.8 billion, up almost 27 percent from $11.7 billion in 2010.